, esq. of Corscombe in Dorsetshire; a gentleman whose “Memoirs.” have been printed in two splendid volumes, 4to, 1780, with a considerable number of plates by Bartolozzi, Basire, and other engravers of eminence, and an admirable profile of himself in the frontispiece, was born in London, April 14, 1720; and sent to school, first at Newport in Shropshire, and afterwards at St. Alban’s. At 14, he was sent to Amsterdam, to learn the Dutch and French languages, writing, and accompts; stayed there about fifteen months, and then returned to his father, with whom he continued till his death in 1735. 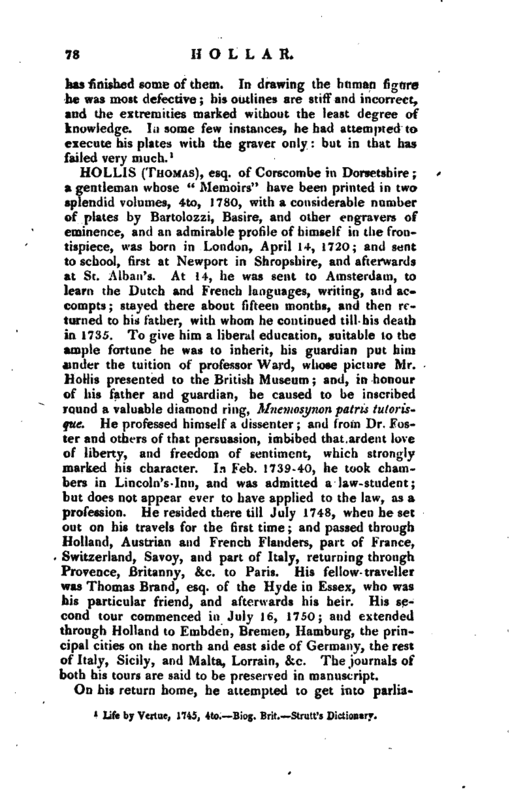 To give him a liberal education, suitable to the ample fortune he was to inherit, his guardian put him under the tuition of professor Ward, whose picture Mr. Hollis presented to the British Museum; and, in honour of his father and guardian, he caused to be inscribed round a valuable diamond ring, Mnemosynon patris tutorisque. He professed himself a dissenter; and from Dr. Foster and others of that persuasion, imbibed that ardent love of liberty, and freedom of sentiment, which strongly marked his character. In Feb. 1739-40, he took chambers in Lincoln’s-Inn, and was admitted a law-student; but does not appear ever to have applied to the law, as a profession. He resided there till July 1748, when he set out on his travels for the first time; and passed through Holland, Austrian and French Flanders, part of France, Switzerland, Savoy, and part of Italy, returning through Provence, Britanny, &c. to Paris. 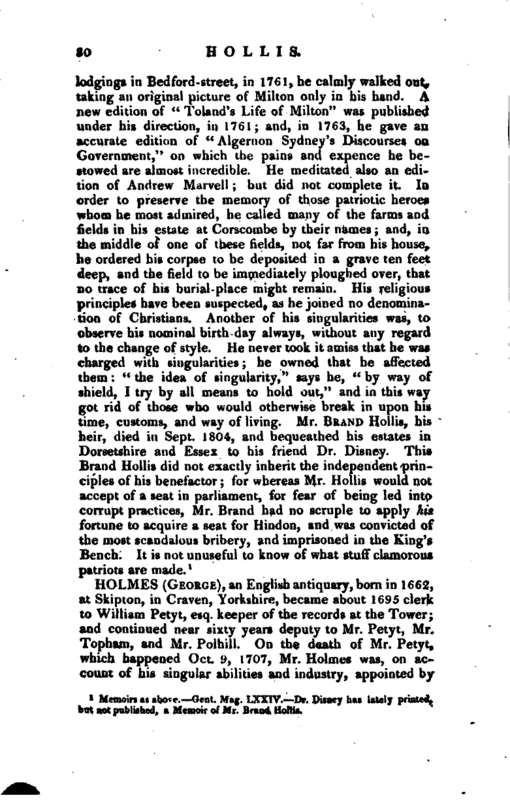 His fellow-traveller was Thomas Brand, esq. of the Hyde in Essex, who was his particular friend, and afterwards his heir. 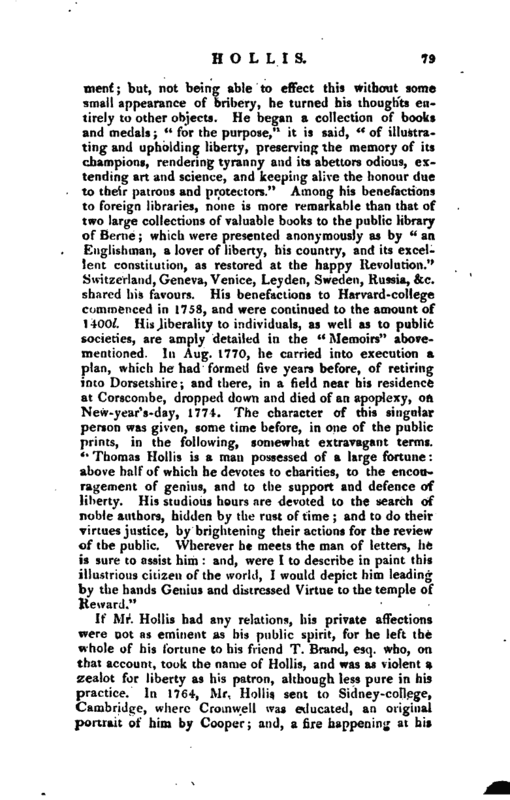 His second tour commenced in July 16, 1750; and extended through Holland to Embden, Bremen, Hamburg, the principal cities on the north and east side of Germany, the rest of Italy, Sicily, and Malta, Lorrain, &c. The journals of both his tours are said to be preserved in manuscript. Memoirs as above. —Gent. Mag. LXXIV. Dr. Disney has lately printed, but not published, a Memoir of Mr. Brand Hollis.